Data storage needs for your evolving small business are increasing at incredible speed whether you are a home or small business office or a branch operation you face the challenge of regularly protecting and managing your important data with limited IT resources. Do-it-yourself data backup methods like off-the-shelf external drives can quickly become overwhelming while the public cloud can carry hidden costs and offer unpredictable Network challenges! You want your data backup to be fast reliable and easy while delivering critical protection against cyber attacks. 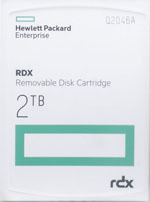 Introducing business class Hewlett-Packard enterprise RDX is a reliable diskspace backup and recovery system that is easy, fast, safe and secure. Simple to adapt into your environment through wide operating system and virtualization compatibility, RDX is highly portable, affordable and offers seamless expansion and scaling options. RDX fortifies your cloud strategy, regain control of your data with fast hard drive speeds and gain faster access to your most critical data the moment you need it keeping a secure readily available offline copy of your data is a strong last line of defense against cyber attacks such as malware and increasingly sophisticated ransomware. Easily rotate your backups on and off premises knowing the durable rugged RDX design keeps your data safe. RDX allows you exceptional flexibility connecting externally and internally to laptops, micro servers, tower servers or even a storage rack to meet your evolving requirements. 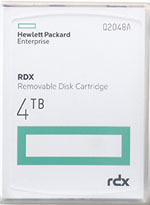 Available in internal and external docks with cartridges from 500GB up to 4TB, RDX offers easy system integration, fast recovery and delivers unmatched Portability and protection for your single server or branch office environment. 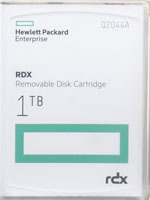 Give your workplace data business class reliability for all its growing needs HPE RDX disk backup and recovery solution. 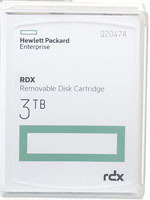 Contact your BackupWorks Account rep today at 866 801 2944 and ask about RDX Removable Disk Storage.